Let our experienced and trusted world-class eye surgeons give YOU visual freedom. Enjoy life without depending on reading glasses! 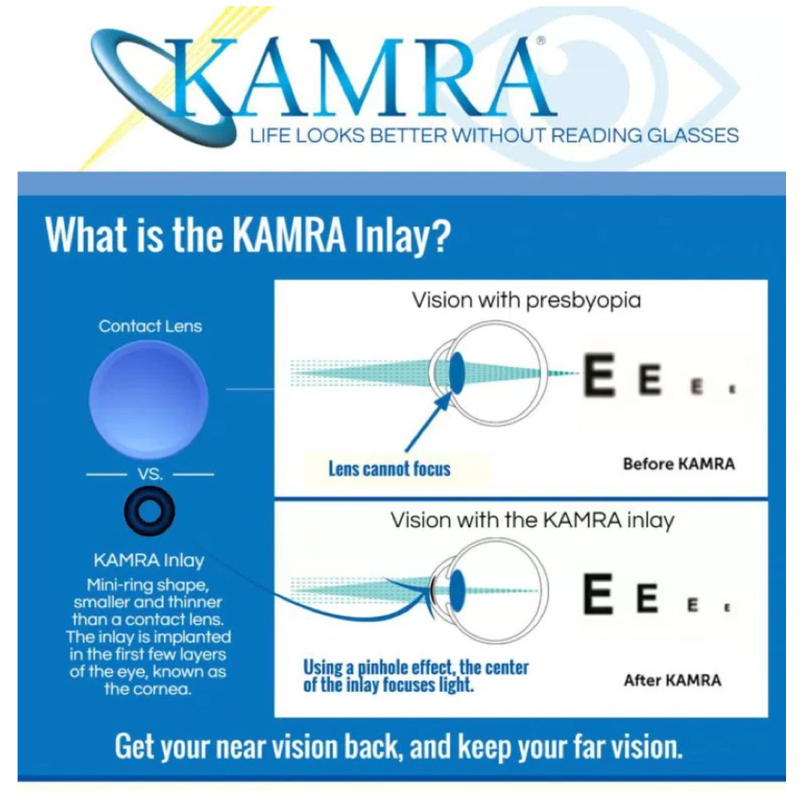 The KAMRA inlay helps end blurry near vision and reduces the constant frustrations of reading glasses for those with presbyopia. It provides a natural range of vision — from near to far. 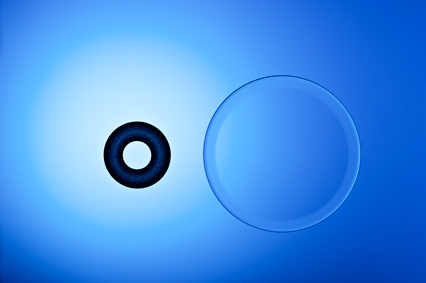 It also offers long-term performance to help you continue to enjoy clear near vision over time, even as presbyopia progresses. The KAMRA inlay is ideal for people looking to no longer depend on reading glasses or contact lenses for their everyday activities. "My decision to have the KAMRA Inlay was one of the best choices I have ever made. I no longer have to have rely on reading glasses for anything. I used to have a pair in the car, the kitchen, the bedroom and at work. I was happy to throw all of them away. It is a great feeling to be able to pick up a book and just start reading. The KAMRA Inlay has also made my intermediate vision crystal clear. I am able to sit at the computer without the annoyance of glasses sliding down my face. 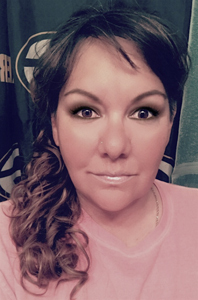 I am also a right eyed hunter and the KAMRA is in my right eye. It does not affect my hunting ability what-so-ever. 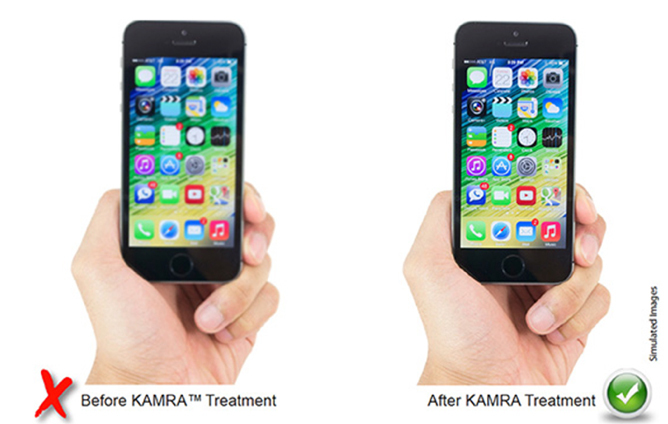 To me, the KAMRA Inlay has been a life saver and keeps me free from wearing glasses." Provides a natural range of vision - from near to far - without blurry zones. Offers long-lasting performance to help you enjoy clear new vision over time. 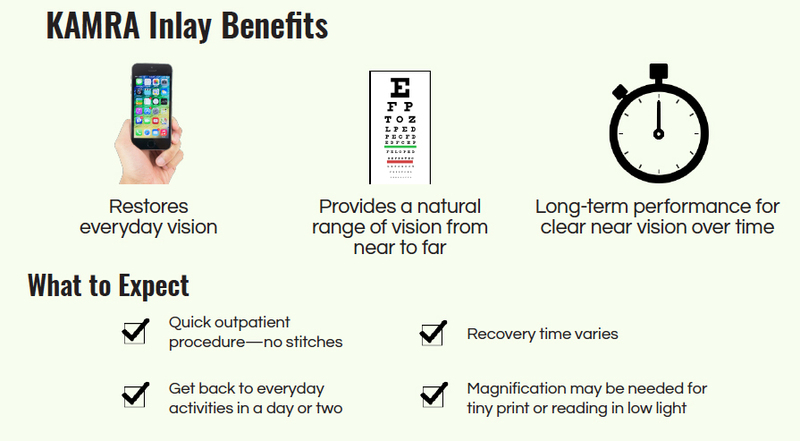 "For more than a year I had researched what options were available to improve my near vision. Over the past 10 years I had tried bifocals, progressions and readers. Yet I struggled to find something that fit my lifestyle. As my daily routines seemed to become further compromised I just could not find a permanent solution. I was no longer able to read at night, under dim lighting or while exercising. If I forgot my glasses, I sat through meetings or shopped having to ask others to read things to me. I was beyond frustrated. Then while driving to work last December I heard the radio commercial for Optivision’s new Kamra Inlay. I called intending to just check it out. Within a few days I found myself driving to an appointment. I told myself to prepare to be disappointed. I was so impressed AND excited at what I learned that I immediately scheduled the surgery. The surgery was fast and painless. I was back at work the next day. Within a few days I was getting glimpses of the vision I once had. By week two I could write notes without my glasses and actually read them. (It was exciting!) Four weeks post-surgery I realized I was doing the majority of my work and daily interactions without glasses. Each day my vision was improving as was the quality of my life. The freedom to return to a normal life and do things I thought were only in my past felt amazing. I want to thank Dr. Dudley and Optivision for their great care. The difference that the Kamra Inlay has made is truly a blessing." Only Doctors in NE Wisconsin performing this procedure! 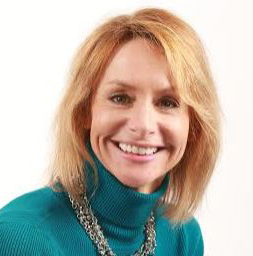 When it's your eyes, demand the best, most experienced eye surgeons doing your surgery. 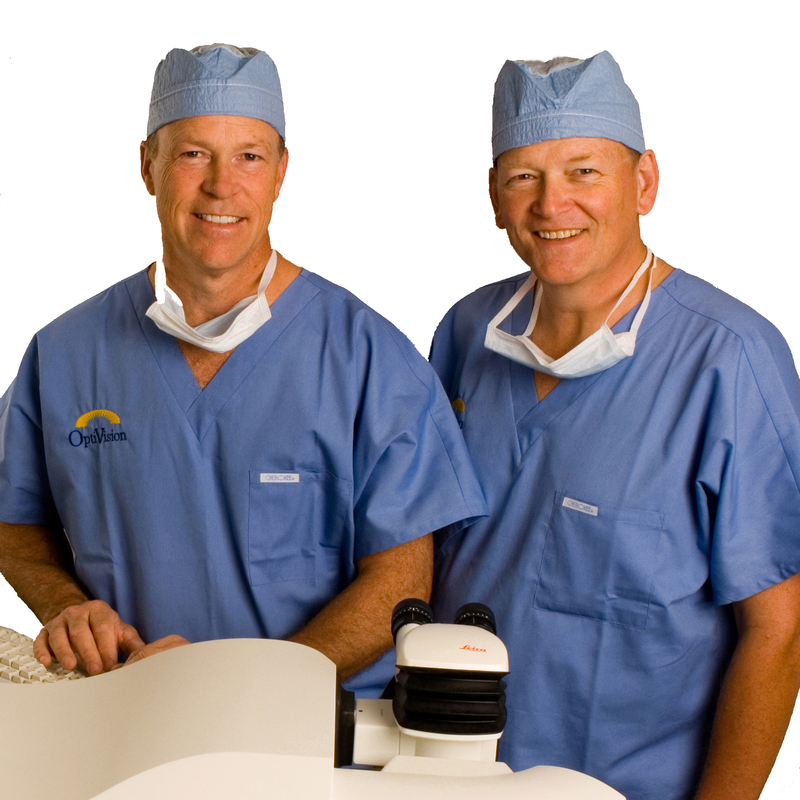 Ask for Dr. Gerald Clarke & Dr. Stephen Dudley, surgeons you can trust. Our entire staff is certified, giving you the highest quality care available.